Monster Eye’s & Green Slime Smoothie. Slime & Monster eyes – sounds like something out of a horror movie, but when you tell your kids, they will find them begging you for this smoothie. 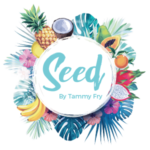 Every mom reading this blog would fully appreciate the effort it takes to hide, mask, blend, and even offer rewards for finishing foods that are healthy, but fear not…this recipe will have the pickiest of eaters happily sipping away on a straw! It takes a few seconds to whip together and even less time for the kids to devour. Us devious mums are always trying to figure how to sneak the good stuff into our meals – this smoothie is the answer! Blend the kale, kiwi and coconut ice cream together and set aside. To assemble: decorate the glass with a few kiwi slices by placing then firmly against the glass. This is optional. 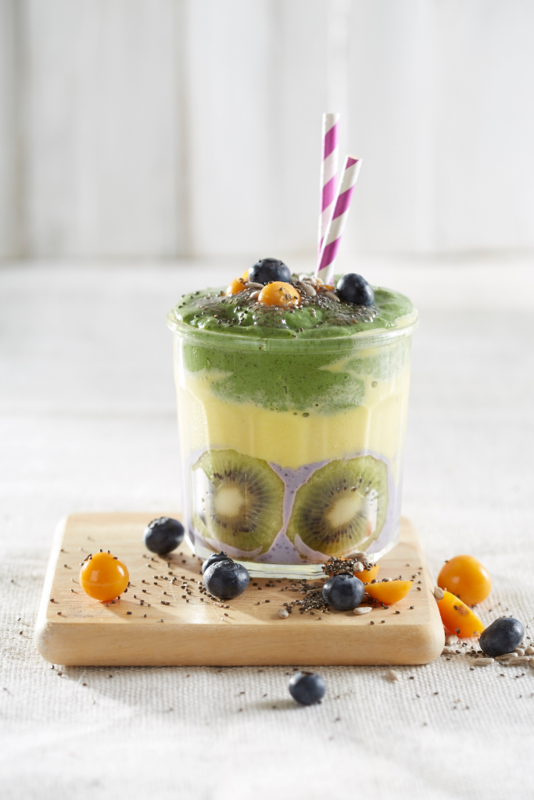 Pour the blueberry smoothie into a glass, carefully pour over the mango smoothie and layer carefully with the kale and kiwi smoothie. Let the kids garnish with berries and chia seeds.